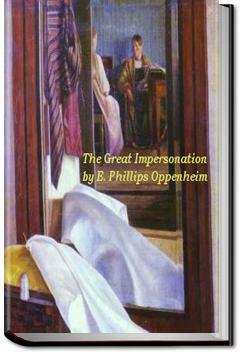 The Great Impersonation is considered by many to be E. Phillips Oppenheim's best novel. The story focuses on German espionage in England prior to the start of World War I. The tale centers on two characters that are almost identical in appearance. Indeed, while both attend the same school in England, they are often mistaken for one another. One character is Sir Everard Dominey, an English baronet who enjoys the “good life” but falls into disfavor when he is accused of murdering Roger Unthank. Unthank, of the same village, has an infatuation for Dominey’s wife, Rosamund, and attacks Dominey. Dominey comes before his wife bloody and ragged after the struggle with Unthank. The spectacle renders her unbalanced. This is more than Dominey can bear and he goes on a long travel and drinking binge spanning years. Dominey’s wife threatens to kill him if he ever returns. The second character is Baron Leopold von Ragastein, a German nobleman. Von Ragastein has fallen into disrespect with the Kaiser for his affair with a Hungarian princess and subsequent killing of her nobleman husband in a duel. He is banished to a minor government position in East Africa as punishment. A chance encounter between Dominey and von Ragastein in German East Africa sets the pretext for the story. Von Ragastein returns to England as Dominey, to regain his position in society, and serve Germany by influencing England to keep out of the coming conflict. There is one problem however: there are some, including Dominey’s wife, who are not convinced that Sir Everard Dominey is really who he claims to be.
. . . choose to have you concentrate the whole of your energies upon one task and one task only. If there is anything of the spy about your mission here, it is not England or the English which are to engage your attention. We require you to concentrate wholly and entirely upon Terniloff." "Terniloff?" he repeated. "I expected to work with him, but—"
"Empty your mind of all preconceived ideas," Seaman enjoined. "What your duties are with regard to Terniloff will grow upon you gradually as the situation develops." "As yet," Dominey remarked, "I have not even made his acquaintance." Just great, the plot events keeps you immersed in the book. I love how the author made such real characters and how he turn the pace of events. A slim novel with a great surprise at the end, I would love to see the movie, but couldn't find it. I read about this book somewhere, so thought it was worth trying. Very dated tosh, especially when it comes to the women who fawn over the central character. All right if you read it as an example of the sorts of books people thought were thrilling back in about 1920, but not otherwise. Excellent espionage suspense novel set in the time leading up to WW1. I thought I read this because of a review by Michael Dirda of the Wash. Post on Oppenheim's writings, but I can't find any such review online. Dirda or no, the review warned me this wasn't a literary gem. My interest was in spy novels that preceded Eric Ambler or John Buchan.